One of the things that need to be changed when planning to remodel your garage is the floor. Concrete floors serve the purpose of flooring but do not look good, even if you paint it, the floor will look bare. By refinishing the floor with a Garage Floor Epoxy Sealant, you will not only improve the look of your garage, your floor will last years longer, due to the sealing of the concrete! battery acid, grease and any other dirt that gets into your garage. In almost every type of garage floor sealant, the steps are the same. The only differences come at the end of the process, when you actually apply the epoxy sealant to the floor. In order to get ANY type of sealant to adhere to your concrete floor, it has to be clean. Start by completely emptying your garage of everything that sits on the floor! You want the floor to be 100% free of everything! After you have everything moved out, start with a stiff bristle broom and sweep the entire floor clean of any debris. If you have stubborn areas that just wont come clean, grab a small scraper or a square end shovel, and scrape all debris off. Some may tell you not to get the floor wet at all, to be sure there is no moisture under your sealant. Of course you don’t want to put the Garage Floor Epoxy onto a wet or damp concrete floor, but by hosing your floor off now, you will instantly be able to spot trouble areas, before you seal it! Oil or greasy spots under your floor epoxy will leave it useless and the epoxy may stick today… but will lift within a few months! Spray your water hose over the floor and watch for areas that the water runs away from immediately! 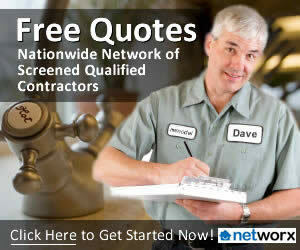 Chances are pretty good there is an oil stain or residuals of the oils still on your concrete. Once you identify the spots that are repelling the water, go after them with bleach or some other high concentrate flooring cleaner to completely remove any trace of oil. Some garage floor epoxy systems require you to actually etch the floor with an acidic solution, this is the time to do it! Mix the solution per the manufacturers directions, put on your rubber boots and grab a respirator mask. Apply the solution from the back of the garage and work your way out with a stiff garage broom. After you have etched the floor… allow 4-6 hours for the surface and any cracks to dry completely, and begin the application of the epoxy and finish coats. Grab a roller with a long handle and an old paint pan. Starting at the back wall, make one roller width pass, getting as close to the walls as possible. Some systems may suggest you brush the edges first, but by using your roller for the first edge pass, you will see for sure exactly how far you need to brush the finish onto the floor. After you have the back wall completely edged with your brush, repeat the process on the remaining walls. Once your edging is complete, return to the back wall and start rolling the entire floor surface. If you have a decorative sprinkle on finish, make sure you pause every few feet and apply the speckle to the floor before you can no longer reach the area. Most garage floor epoxy systems require not only the latex epoxy to be applied, but also a water and chemical resistant sealer. In most cases, you will need to let the first coat dry for 24 hours before the sealer is applied. Roll the sealant on in the same fashion you did for the epoxy itself. Remember not to walk or drive on the new epoxy sealed floor for at least 24 hours! 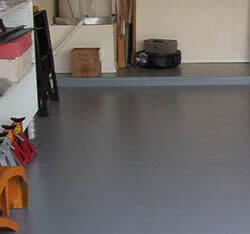 Enjoy your handiwork and know you now have a new Garage Floor with an Epoxy Finish!